As you may have noticed, I’ve been spending a lot of time with blackberries lately. This is my third post so far in less then a week, using the antioxidant rich dark purple berry. There may or may not be more to come while they’re still in season. Hubby has been quite taken by them lately so we’ve been buying them by the loads and putting them here, there and everywhere. They’re delicious raw, cooked, baked, and blended, adding a touch of sweet tartness. They have one of the highest antioxidant levels of all fruits, have powerful anti-inflammatory benefits, are rich in vitamin C and have good amounts of vitamins A, E and K.
They’re also in season, late summer through to early autumn, so its the best time to get them! Porridge is one of those things that doesn’t need a recipe and it always comes out great, but if you’re curious about this one, here’s the drill. 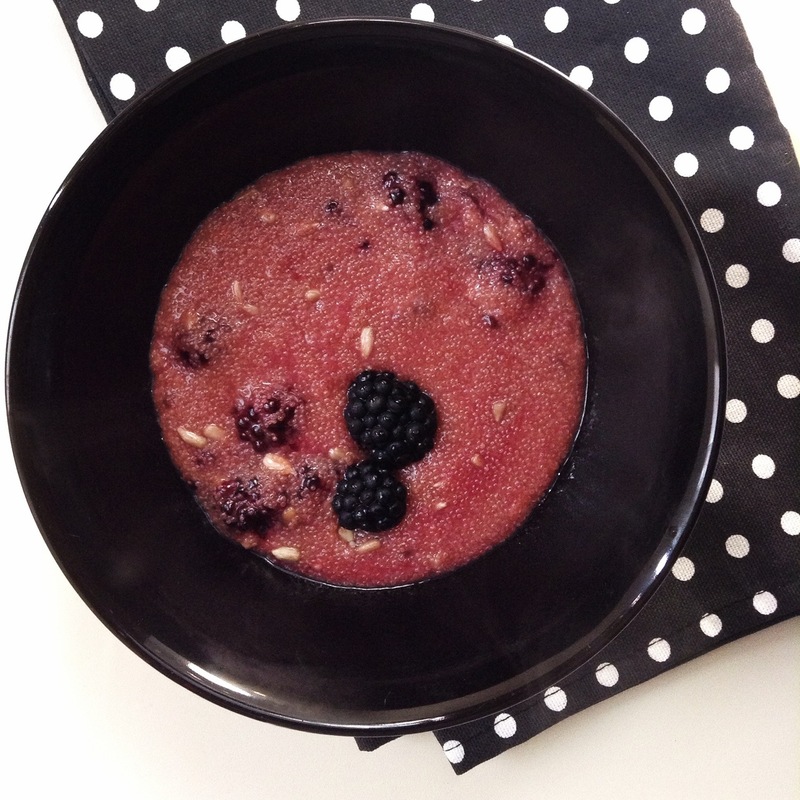 Antioxidant rich blackberries, calcium rich sunflower seeds and protein rich amaranth make a wonderful vegan gluten-free breakfast combination in this creamy purple porridge. Add amaranth and water to a pot and bring to a boil. Reduce heat to low and let simmer for about 25 minutes until it absorbs all the water, being sure to stir it up in the last 10 minutes as it starts to bubble and splatter. Add blackberries, sunflower seeds, cinnamon and/or vanilla and rice milk and stir to combine and heat through until the blackberries start to breakdown and the porridge turns thick and bright purple.